Independent Record label started by Herb Abramson in New York City in 1946, intially concieved as a gospel label but which soon got into comedy records. Abramson had been a producer at National Records, getting the label The Ravens and Billy Eckstine, two of their biggest stars. Deciding go out on his own he started Jubilee and Quality Records with Waxie Maxie Silverman, a Washington D.C. record store owner of some renown. The labels didn’t work out and Jubilee was sold to Jerry Blaine, a New York record distributor who also struggled initially to make a go of it. Meanwhile Abramson hooked up with Ahmet Ertegun to start Atlantic Records in 1947, which fared no better at first. In time both of the labels would turn around when they were among the first to embrace rock ‘n’ roll. Jubilee’s entry into rock came via The Orioles, a novice group out of Baltimore who Blaine initially started ANOTHER label to separate them from Jubilee’s main output in other fields. But when “It’s A Natural Records” proved too confusing, and too close to National Records, he switched The Orioles to Jubilee where they’d spend the next half dozen years keeping the company afloat almost singlehandedly as their most prolific and best selling artists. Finally in the early 1950’s they added some other credible acts, among them a teenaged Edna McGriff, The Marylanders, and they managed to get some hits out of The Four Tunes as well, but by 1954 Blaine formed a subsidiary called Josie Records where most of the subsequent rock acts wound up. As a result Jubilee never regained the prominence in rock they had after The Orioles heyday but did have some name artists and decent sellers from time to time in the field, most notably Betty Harris and a post-Motown Mary Wells. Otherwise they were mainly a repository for past their prime acts like The Ravens and Dominoes in the mid-1950’s and to a lesser degree The Bobbettes, Joey Dee & The Starliters and The Skyliners in the mid-1960’s all of whom provided recognizable names but no sales. Despite the lack of genuine hits they did have a couple of historically interesting releases over the years. They were the home of Doug Clark & His Hot Nuts, the notoriously raunchy frat house band that was the inspiration for Otis Day & The Knights in the movie Animal House. 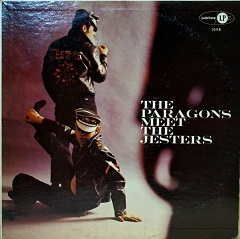 More importantly they helped to shape the concept album in rock with their records pitting two groups against one another (each group getting one side of the LP), the most notable of which was The Paragons Meet The Jesters with its gang-scene showdown cover which itself was highly influential in how rock music would be presented. Aside from The Orioles though their biggest legacy has to be the rarest officially released rock single ever, The Five Sharps 1952 version of “Stormy Weather”, only a handful of which are known to exist making it the most valuable rock record of all-time. Though never among the upper echelon of independent labels, Jubilee was one of the longer lasting ones, eventually shutting down operations in 1970.